The R-4D acceptance testing was a critical milestone in the Orion Service Module Auxiliary Propulsion Program. Completion of this testing demonstrates incremental progress and opens the way for the next phase of development testing. 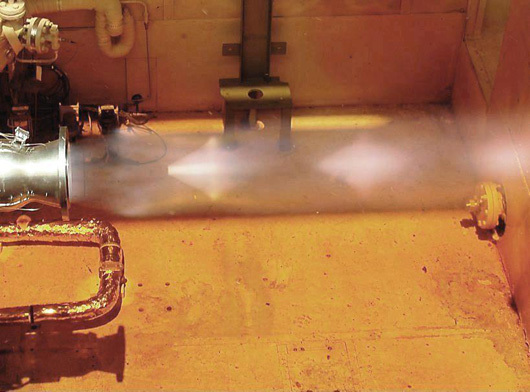 This testing achieved several firsts for the program including flight design bimetallic (Columbium-Titanium) nozzle; flight design valves (120V and 72.25 ohm coils); flight-like pressure transducer; validation of Orion-specific fabrication and test processes; verification of Orion-specific tooling and special test equipment; and demonstration of new processes that include the Aerojet Electric Discharge Machined (EDM) R-4D -11 injector. “It was very gratifying to see the fruits of a three-year design effort come together in a very successful engine test. It was a flawless demonstration of engineering and manufacturing expertise,” said Aerojet Orion Program Manager Scott Jennings. Aerojet supplies the complete engine complement for the Orion Service Module including: 16 Â 25-pound-thrust engines arranged in four pods providing RCS capability, eight 100-pound-thrust bipropellant engines arranged in four pods providing auxiliary axial thrust for system maneuvers and a 7,500-pound-thrust Orion main engine providing axial thrust for major position changes and deorbit. Additionally, Aerojet will supply 12 160-pound-thrust monopropellant engines for the Orion crew module reaction control system and the jettison motor that provides thrust needed to separate the launch abort system from the crew module in either a nominal or aborted launch scenario. Lockheed Martin is the prime contractor to NASA for the Orion crew exploration vehicle, which is being developed as the nation’s next generation spacecraft for future human exploration throughout our solar system. Aerojet is part of the nationwide Orion industry team led by Lockheed Martin, which includes five major subcontractors and an expansive network of minor subcontractors and small businesses working at 88 facilities in 28 states across the country. Orion is scheduled to make its first orbital test flight in 2013.